The Forum Kitchen Sink is a new board for 2013 with a lot of new tech but still has some old reminders to the late great Forum Seeker. We all had a lot of fun on this all mountain board. It has a great balance between an aggressive board and a forgiving ride. It does have that new pointy look similar to the K2 Happy Hour in the tip/tail. Instead of flat camber like the Happy Hour this has a hybrid camber set up that is camber in the center to flat in the tip/tail. We all really loved the responsive all mountain freestyle ride and feel like it can live better outside the park than every other Forum snowboard. This is not a Good Ride favorite but it deserves an honorable mention. It was really really close to making the list as an All Mountain Freestyle Favorite. It’s hybrid camber design and all around ride brings back memories of the discontinued Forum Seeker that we all liked soo much. This is a fun and very good all mountain freestyle board for those that like to go big and love that old school pop that you get from Camber plus a little more that you get with the flat tip/tail. On Snow Feel: The Kitchen Sink is stable and catch free in all conditions. It’s very easy one footing and flat basing. It’s right in between those boards that are made to bomb groomers and the other boards that are meant to play around on groomers. It can satisfy both moods well but not completely thrill you in either. In the park it’s kind of like on the mountain. It can go big and also be mellow enough to be small. Turn Initiation and Carving– The Kitchen Sink has a moderate flex and is fun for an aggressive all mountain freestyle rider. Quick short radius turns take a little work but it’s not bad at all. Getting into wide to carving turns is where this board shines. It’s great to lay into a carve with this board and the mellow camber to flat makes for a great groomer carving board. We had a lot of fun laying into a carve on this board. Flex: Even though this is one of the more aggressive boards in Forums line it’s still relatively easy to butter. It still doesn’t compare to the Chilidog or Double dog shapes forum offers but it’s pretty fun for a hybrid camber. It feels like a medium flexing board. Edge Hold: One of the qualities we liked with the Seeker was the solid dependable edge hold and it seems that the Kitchen Sink is offering similar qualities. Speed: It’s also pretty decent with speed and we feel it’s the most aggressive board in Forum’s line. Jumps: When we say pop we mean pop in ollies as well as carves. Nothing comes close to camber for throwing out a good turn. Some other boards can match the pop in ollies but carves for the most part still stand alone with camber. Jibbing- Probably Forum’s least jibbable board in their line but you can still play around if you want to hit a wide box or a bonk all is well. I think most of us would rather be on one of the softer Forum boards. Pipe: Lot’s of fun in the pipe. We were really pleased with the directional drive and the way it climbed a pipe wall. Jumps: Even though this isn’t a directional twin or a twin the Twinish shape is really close and this is a fun jump board. The pop for an ollie is pretty good and this board would do really well lapping the roller coaster line in a park or launching off a large natural drop on a pow day. 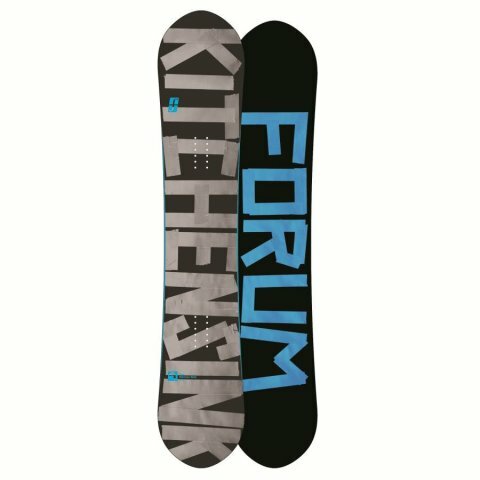 All in all it’s nice to see forum bring back the more aggressive ride into their line. We try to get as many images of the Forum Kitchen Sink, but forgive us if they're not all there.